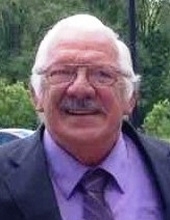 Thomas Joseph Snyder, age 78 of Butler Township, formerly of Gibsonia, died Saturday, Jan. 26, 2019, at the VNA Inpatient Hospice, Butler, after a short illness. He was born May 7, 1940, son of late Wilbert J. Snyder and Margaret E. (Weidner) Snyder. Tom was a retired truck driver for Yellow Freight Systems and a member of Teamsters Local 249 for over 25 years. He was a member of St. Fidelis Catholic Church of Butler, and also a former member of St. Catherine of Sweden Catholic Church in Hampton Township for 30 years, where he served as an usher for 20 years. He also was a member of the U.S. Army Reserves from 1962 to 1968. Tom enjoyed fishing and gardening, and was a devoted Pittsburgh Steelers fan. He is survived by his loving wife, Antoinette (Toni) Tronko Snyder, whom he married Nov. 22, 1962. Also survived by 3 children, Keith T. Snyder and his wife Melissa Snyder; of Chicora, Kimberly M. Snyder of Baden; and Christopher L. Snyder and his wife Linda Snyder of Ross Township. Also survived by one brother, Gerard J. (Barbara) Snyder; four sisters, Joan E. Lippold, Margaret A. Hancock, Marian P. (Mel) Audley, and Charlotte J. (Bill) Hilderhoff; sister in law Evelyn Snyder; two step-granddaughters, Melissa (Brad) Craig and Chrystal Nelson; two step-great-grandchildren, Zoe & Issiac; and many nieces and nephews. He is preceded in death by three brothers, Wilbert P. Snyder, Jerome Snyder and Regis Snyder; two brothers-in-law, Herman Lippold, and John Hancock, and one grandson, Adam D. Snyder. A visitation will be held at King Funeral Home and Cremation Services, Inc. 2841 Woodland Circle Allison Park on Tuesday January 29 from 2-4PM and 6-8PM. A Mass of Christian Burial will be at St. Catherine Roman Catholic Church on Wednesday at 10:00 A.M.
To send flowers or a remembrance gift to the family of Thomas J. Snyder, please visit our Tribute Store. "Email Address" would like to share the life celebration of Thomas J. Snyder. Click on the "link" to go to share a favorite memory or leave a condolence message for the family.